Since DARC members are mostly also SCA members we regularly go to SCA events to have fun, and play with our research areas. 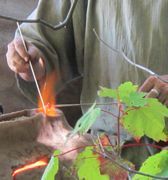 This is much more experiential and experimental archaeology but can still be a great deal of fun. Although many activities would have happened over the weekend only the beads survived in photographs.